When I say Movado Watches, you have to think of understated elegance. This sophisticated brand has built a well-deserved reputation for designing amazing men’s and women’s watches that goes way back. Today I’d like to tell you about the 800 Series, by Movado. The 800 Series is a beautiful, bold collection, with Tom Brady as the Ambassador and a special edition Tom Brady 800 designed…you might think this is for boys “only”. It’s not. Movado has included a lovely selection of ladies 800 timepieces…let’s see. 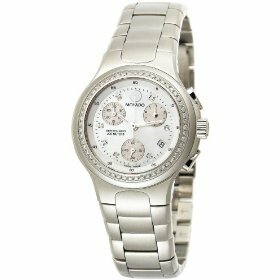 Here’s the 2600052 Women’s 800 Series Bracelet Watch. Wow, this is beautiful. This is a multi-function, Swiss Quartz timepiece. It is made from high quality stainless-steel, and comes in a brushed finish. The dial is round in shape and has a scratch-resistant sapphire crystal and the face is crafted of luxurious Mother-of-Pearl. The bracelet is beautiful brushed steel, as well, and comes equipped with a deployment clasp. The 800 Series Bracelet Watch, by Movado is also water-resistant to a depth of 660 feet! This women’s timepiece is a great example of Movado’s style. The soft lines of Movado stand out. They infuse all of their designs with artistic elements, which make Movado watches, simply irresistible, and the fact that they are high quality instruments, seals the deal.